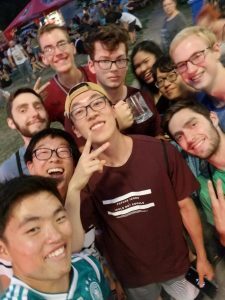 Here are just a few fun things that I have experienced personally in Germany! A week ago, we had a free Friday evening to do what we wanted. Naturally, a group of us got together to go to the Berlin Beer Festival. It was a great experience and was very fun to walk by all the vendors and see/taste all the different beers at the festival. The apple beer seemed to be the group favorite. Although it was altogether fairly expensive, we all walked away with a new beer stein and smiles on our faces. In the city of Bremen, there is a centuries-old poem called the “Town Musicians of Bremen” (written by the Brothers Grimm), with the four animals shown in the picture above as the main characters. 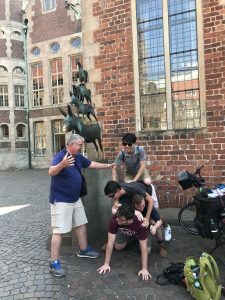 This town statue marks the importance of this story to the people of Bremen and was surrounded by tourists when we found it. Professor Nielson insisted that we make a duplicate of the statue, and this was the result. The experience was very fun, and made everyone, even outside of our group, laugh. The ice cream in Germany is delicious! 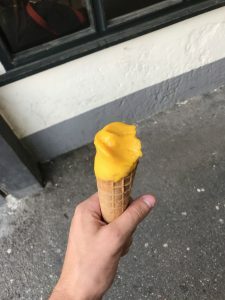 Shown above is my favorite flavor, mango, in the typical homemade waffle cone. The ice cream is not nearly as sugary as in America and is a lot lighter-sitting. As a cheap and common snack here in Berlin, the ice cream became very popular with our group. I will miss this ice cream when I get back to the states. Next Next post: What’s It Like?